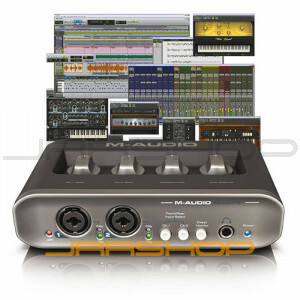 The M-Audio® MobilePre turns your Mac or PC computer into a powerful music recording and production studio. Building on the success of the bestselling* MobilePre USB, this next-generation audio interface makes it easy to record guitar, vocals, keyboard, and more with pristine sound quality. The included, easy-to-use Pro Tools® SE music creation software is based on the same powerful Pro Tools application used in studios around the world, delivering pro recording features, effects, virtual instruments, and more to polish your music. MobilePre also provides the broadest software compatibility in its class—from Pro Tools* to GarageBand, Logic, Live, Record, and more. The next-generation MobilePre delivers even more pro features than the bestselling original*, so you can record a wider variety of sources with higher audio quality. Connect guitars, microphones, keyboards, drum machines, synths, and other devices, and simultaneously record two sources with 24-bit/48 kHz (better-than-CD) sound. Thanks to the ergonomic design, you can control input gain and volume with convenient top-panel knobs, and monitor your recording without latency at the press of a button. The included Pro Tools® SE music recording and creation software delivers many of the same powerful features that studio professionals use to create Grammy® award-winning albums, Emmy® award-winning television shows, and Academy Award®-winning films. This easy-to-use software lets you create music with up to 24 tracks, and also includes a huge loop library and over 100 virtual instruments to build out your mixes. Add EQ, reverb, and other built-in effects to make your music sound professionally produced. If you want even more tracks, effects, virtual instruments, and loops, MobilePre is compatible with Pro Tools** software, the recording platform used by studio professionals around the world. You can also use MobilePre with GarageBand, Logic, Live, Record, and virtually every other popular music application. Want to record guitar with your computer? What about bass or keyboards? MobilePre is the answer. Simply connect it via USB to your PC or Mac, plug in your instruments, and you're good to go. You can also use the included Pro Tools SE recording software and effects to layer tracks with your instruments and create professional-sounding mixes. MobilePre features switchable +48V phantom power, so you can connect a studio-grade condenser (powered) microphone like the M-Audio® Nova for pro-quality recordings. The interface's two-input, two-output design lets you record a vocal mic and another instrument simultaneously, so you can capture song ideas or collaborate with other musicians. All digital audio recording systems introduce a small delay between the instrument input and the output coming from the computer. This "latency" can be distracting enough to cause pitch and timing errors when you're recording. MobilePre solves this latency problem with a direct monitor button, which lets you hear your instruments directly through the interface before they go into the computer. Professional music creation has never been more accessible. Designed for use with select M-Audio recording interfaces, Pro Tools MP 9—the latest version of Pro Tools M-Powered™ software—improves upon the industry-leading features that made it the top choice for music and audio production. Enjoy 48-track mono or stereo audio recording, editing, and mixing with up to 24-bit/96 kHz fidelity. Shape sounds and add effects with over 70 included plug-ins. Easily compose music with full MIDI and score notation tools. Get great-sounding, phase-accurate mixes with Automatic Delay Compensation. And collaborate with other Pro Tools users in studios around the world. Pro Tools MP software puts all this power—and much more—at your fingertips. Pro Tools is the world’s most popular, most advanced music and audio production platform. Now Pro Tools MP 9 software gives you the power to work with many of the same features that make Pro Tools the top choice of today’s audio professionals. Create amazing music, collaborate with other Pro Tools users, transfer projects between professional and personal studios, and more. The possibilities are endless when you’re part of the largest community of digital audio workstation users on earth. A wide variety of M-Audio hardware peripherals are compatible with Pro Tools MP software, giving you more options in where, when, and how you work. Whether you need just a little I/O or a lot—or a desktop, mobile, or hybrid system—you’ll find the perfect solution with our PCI, USB/USB 2, and FireWire audio interfaces. To get the best of the hardware and software worlds at an exceptional value, check out one of our complete Pro Tools MP studio bundles.